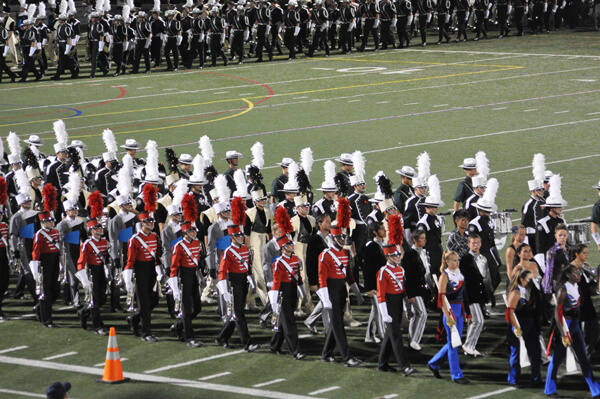 Leave it to the Boston Crusaders—old and new school drum corps personified—to hold the first CYO Nationals Tribute, honoring one of the great contests of yesteryear at Veterans' Memorial Stadium in Quincy, Mass. Three generations of local drum corps, drill teams, and CYO Bands gathered at this venue over the years and either marched to victory or cringed at what "might have been" when scores were announced. On an early July night last summer, three generations gathered to watch some of today's best take the field. One former Crusader was watching his granddaughter, a third generation marcher and possibly a third generation Crusader take the field. Some in the crowd held the St. Kevin's Emerald Knights as the standard nearer. For my generation, 27th Lancers led the pack. There were the typical debates—key of G verses B flat, did dolor guards dance too much, why don't front ensembles march, yet we marveled at what was taking place on the field. Madison played to old friends. The Crusaders couldn't help but feel the love. We were happy to see the Crossmen, and were glad Spirit returned to Atlanta where they belonged, and while some of their former competitors admitted to loving their hornline though they considered them upstarts, showing that some rivalries never die. We wondered if Carolina Crown's pale yellow uniforms meant a Bridgemen style show, and when we saw the guard, realized that the controversial "hot pants" of the 1970's Blue Stars and Garfield Cadets were tame in comparison with Crown's Rach Star outfits, but Crown wowed us and was paid the ultimate compliment—their drill was deemed by a former Lancer as intricate and as clean as 27th's, a high praise to say the least. While we realized that the good old days were history, and knew that one day those on the field would join us in the stands engaged in similar conversation, the finale reminded us that one thing has never changed. As the competitors marched onto the field and scores were announced, the pride on their faces said it all—junior drum corps is all about young people striving to do their best, making difficult shows seem easy and wooing a crowd with their musicality and creativity. Spartans, Jersey Surf, Spirit, Madison, Crown, and Boston, thanks for a great night.